I love neutral colours for eyeshadows. I have about three different quads with neutral colours. I've heard of these shimmer strips but never tried them out. This was on sale the other day when I went to Wal-Mart. Most of the Physicians Forumla products was half off. This is originally $14 CDN and with the sale I got it for $7 CDN. They have palettes customized for your eye color this one is for brown eyes. It's part of the Bronze collection. You get nine different shades and with these it says you can create three different looks. You also get a brush but I usually just leave those and never use them. The back of the box shows the three different looks which are: Natural, Playful, and Dramatic. You can use these eye shadows wet or dry. There's also a eye diagram that shows you how to put the colours. These's colours are very pigmented, the swatches are just one swipe. They're not chalky or too shimmery. They're also very easy to blend. I like the mix of browns, golds, and purples. This is good travel friendly palette. 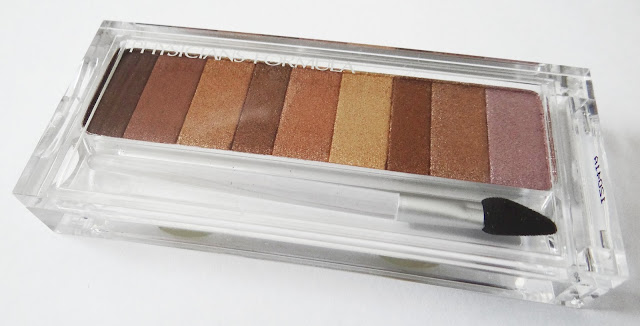 It has all the essential colours for a easy neutral eye look. I've been using this palette a lot lately and I'm very impressed by the quality of this. I'm hoping to go back and purchase more Physicians Formula products to try out before the sale ends.